Last week, I took a look at the returning sitcoms that I'm looking forward to this fall. This week, I'll be doing something similar - only instead of returning series, I'll be taking a glance at some of the most exciting new sitcoms the networks have to offer this year. I'll be honest - it seems like a bit of a light slate this year, and not much is quite popping out to me as super promising. But there's still a handful of interesting shows that I think might be worth tuning into. I haven't seen any of these shows yet, but these are the shows I'm most looking forward to based on their trailers, promos, synopses and cast details. 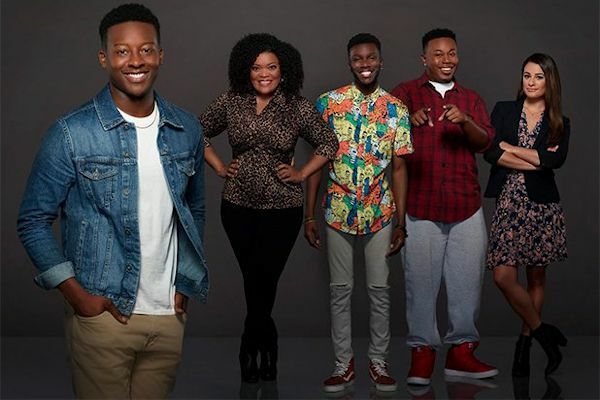 The Mayor (ABC) - Of all of the network sitcoms premiering this fall, The Mayor has the most promise. The series follows a young rapper named Courtney who decides to run for mayor of his small California town as a joke and a publicity stunt, only to actually win. With a stacked cast (including Community's Yvette Nicole Brown and Glee's Lea Michele), an interesting (and uh, incredibly relevant) premise, and promos that already have some pretty good jokes, The Mayor is the comedy I'm most looking forward to this fall, and I'm hoping it delivers on its promise. Ghosted (Fox) - Ghosted is another high-concept comedy from FOX, who has been experimenting in sci-fi-meets comedy for the past few years, sometimes to success (like with The Last Man on Earth, entering its fourth season this fall) and sometimes to...less success (such as with the quickly cancelled Making History). Ghosted is described as "an action-packed comedy about two down-on-their-luck polar opposites tasked with saving the world from aliens.") This sounds like the sort of show that will either be a delightfully weird and wild time or a total train-wreck. Either way, it should be a good time! Will & Grace Revival (NBC) - Okay, well, technically this isn't a new series, but...it sort of is, right? It's a revival of long-running hit Will & Grace, which aired on NBC from 1998 to 2006 and is coming back for a ninth go around this fall. I'll be honest, I don't have super high hopes for Will & Grace: the original series had its moments but feels a little dated already, and I'm not sure there's much of a place for it in the current TV landscape. Still, it's always interesting when a long-dead TV show makes its way back onto the airwaves and tries to make itself relevant in a different era. I'll be watching Will & Grace and hoping it's better than I'm expecting it to be. Me, Myself & I (CBS) - This is another high-concept comedy, but this time from CBS, who typically plays it a little more conventional (although they do have the uniquely-structured Life in Pieces which they've found some success with, so maybe they're getting a little more daring.) It revolves around follows a single character, Alex (portrayed, primarily, by Bobby Moynihan) in three distinct parts of his life: adolescence (1991) adulthood (present day) and old age (in 2042). Bobby Moynihan was a long-running staple of Saturday Night Live who had tons of hilarious characters and impressions, so I'm interested to see how he transitions into a starring role. He certainly has the talent to carry a show on his own, and the concept here is pretty fascinating, so hopefully everything settles into place and this can be the star vehicle that Moynihan deserves. Those are the network sitcoms that have stuck out most to me this year based on their initial concepts and promotion, As usual, though, I'm always hoping to be surprised by an underdog who comes out of nowhere and surprisingly becomes excellent. Either way, I'll be checking out all of the sitcoms that the networks have to offer, as usual, hoping for the best! Nickelodeon is bringing Walkmans, stonewashed denim and big hair to Nick at Nite with the addition of the popular family sitcom The Goldbergs, beginning Monday, Sept. 18, at 1 a.m. (ET/PT). The series follows the adventures of the Goldberg family as they share the ups and downs of life together in the '80s. Following the series launch, the four-season, 95-episode library of The Goldbergs will continue to air daily at 1 a.m. (ET/PT) on Nick at Nite. 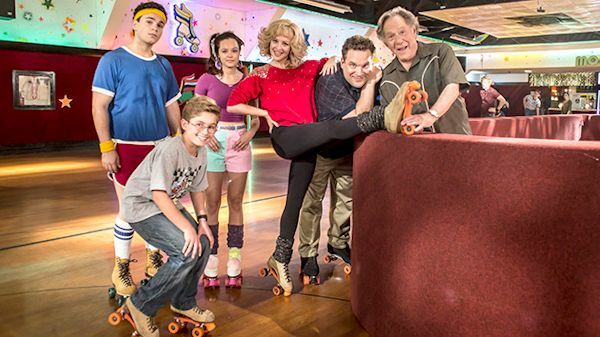 The Goldbergs is entering its fifth season this fall on ABC. The comedy will premiere on Monday, September 18, 2017 and will air every night at 1:00am & 1:30am. The Fresh Prince of Bel-Air will move down to 2-3am, with George Lopez overnight getting sliced to 3am-7am. Nick at Nite's prime schedule will remain as is, with Full House and Friends from 8pm-1am. However, the week after starting Sept. 25, Fresh Prince will air in the 10pm hour as well, taking an hour from House. Back to The Goldbergs, it will also premiere on local broadcast syndication as we mentioned before, starting Sept. 11 with stations like WPIX in NY airing it weeknights at 7:00pm & 7:30pm. And also as we mentioned before, The Goldbergs will air in primetime on Pop TV starting Tuesday, Sept. 26. More info on Pop TV's schedule will be coming soon, so stay tuned. In The Goldbergs, there was a simpler time called the '80s--before there were parenting blogs, trophies for showing up and peanut allergies. For geeky and movie obsessed youngest child Adam (Sean Giambrone), these were his wonder years, and he faced them armed with a video camera to capture all the crazy. The Goldbergs are a loving family like any other--just with a lot more yelling. Mom Beverly (Wendi McLendon-Covey) is a classic "smother," an overbearing, overprotective matriarch who loves her delicious kids, but still rules this brood with 100% authority and zero sense of boundaries. Dad Murray (Jeff Garlin) is gruff and sometimes oblivious, parenting with half his attention span but all his heart. Sister Erica (Hayley Orrantia) is popular and terrifying, doing her best to cover up that she's the smartest of the clan. Barry (Troy Gentile) is a passionate dreamer, who maybe dreams a little too big and who always gets the short end of the stick. Adam (Sean Giambrone) is the youngest, a camera-wielding future director who's navigating first love, and growing up with his family. Rounding out the family is beloved grandfather Al "Pops" Solomon (George Segal), the wild man of the clan, a shameless Don Juan who's learning as much from his family as he teaches them. The Goldbergs stars Wendi McLendon-Covey (Bridesmaids) as Beverly Goldberg, Sean Giambrone as Adam Goldberg, Troy Gentile (Good Luck Chuck) as Barry Goldberg, Hayley Orrantia (The X Factor) as Erica Goldberg, with George Segal (Just Shoot Me) as Pops Solomon and Jeff Garlin (Curb Your Enthusiasm) as Murray Goldberg.